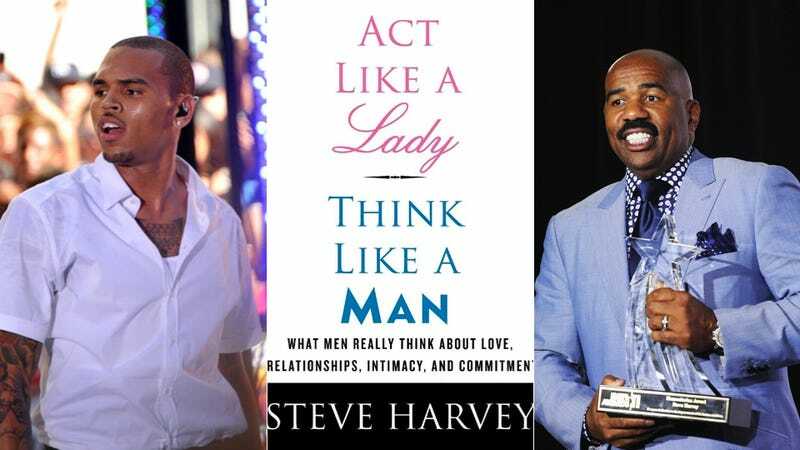 The terrifyingly titled Steve Harvey book Act Like a Lady, Think Like a Man is being turned into a movie. And starring in that movie will be everone's favorite convicted felon, Chris Brown. Men aren't in the talking business; we're in the fix-it business. From the moment we come out of the womb, we're taught to protect, profess, and provide. Communicating, nurturing, listening to problems, and trying to understand them without any obligation to fix them is simply not what boys are raised to do. Detailed conversation is what you have with your girlfriends. Men just want to hear the problem and then fix it. The comedy follows four friends who find their love lives turned upside down when the women they're with start taking advice from Harvey's book. Once they figure out what caused the switch-up among the ladies, the four guys start to adapt the book's teachings for themselves. In addition to Chris Brown, the cast will include Michael Ealy, Entourage's Jerry Ferrara, Taraji P. Henson, Gabrielle Union, Meagan Good and Regina Hall.